Alright well most of the time when I post on here I talk more about the adult brief side. I am not big into wearing adult underwear because they just don’t hold enough for me throughout the day. I do wear them sometimes however on the weekends or on a long day and use them doubling. I will put the underwear down and cut a little slit into the bottom of the underwear put it on and then put the adult brief on top of it. I have found that this works very well especially if you know that you are not going to be able to get around to being able to change. Besides that however I really have not had much experience using these! i wore these a few times overnight but again they just don’t hold like I need them too. Has anyone had any experience with these or know any that would be more absorbent? I don’t honestly even remember which kind I have tried but if anyone has some insight on what they enjoy please let me know! Love your site!! Would love to hear more about the trials and tribs of messing your diapers and the hassle of changing them. It’s something I’m very familiar with. I’m a “normal” guy – my description would be similar to yours; popular, well liked, lots of friends, and I’ve managed to keep this secret from them to some degree. They all know I have IBS, but not how often I end up messing my underpants/diaper. 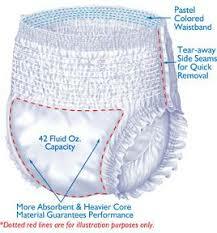 I’ve tried Tena, Depend, and Prevail underwear. For those who wish to be discreet about their diapers (and have mild incontinence, as this style is not the most absorbent), I recommend Prevail because they have a lower waistband. One time, I wore about six pairs of Prevail at once! They’re thin, but six of them is enough to make you unable to put your legs together.